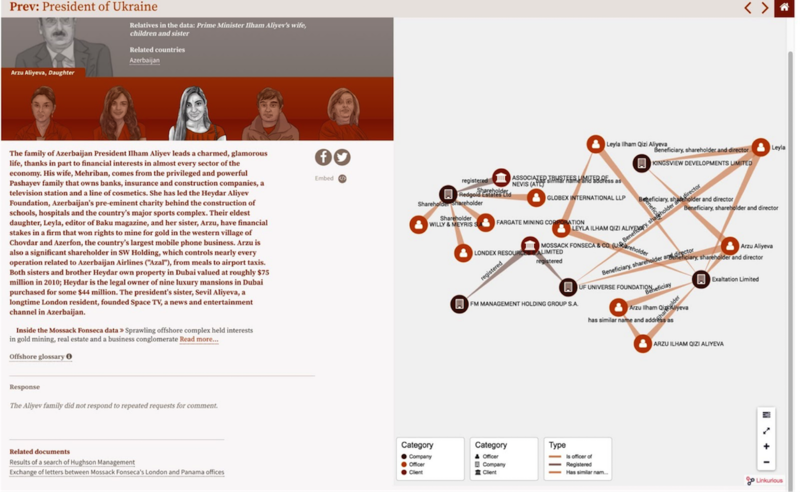 As the world has seen, the International Consortium of Investigative Journalists (ICIJ) has exposed highly connected networks of offshore tax structures used by the world’s richest elites. These structures were uncovered from leaked financial documents and were analyzed by the journalists. 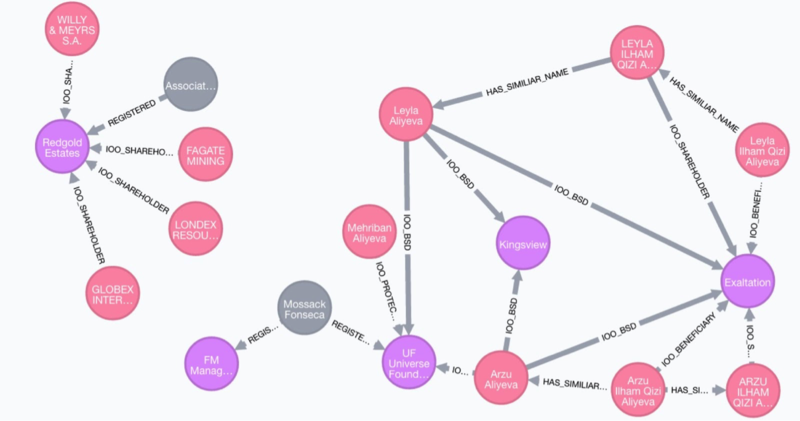 They extracted the metadata of documents using Apache Solr and Tika, then connected all the information together using the leaked databases, creating a graph of nodes and edges in Neo4j and made it accessible using Linkurious’ visualization application. 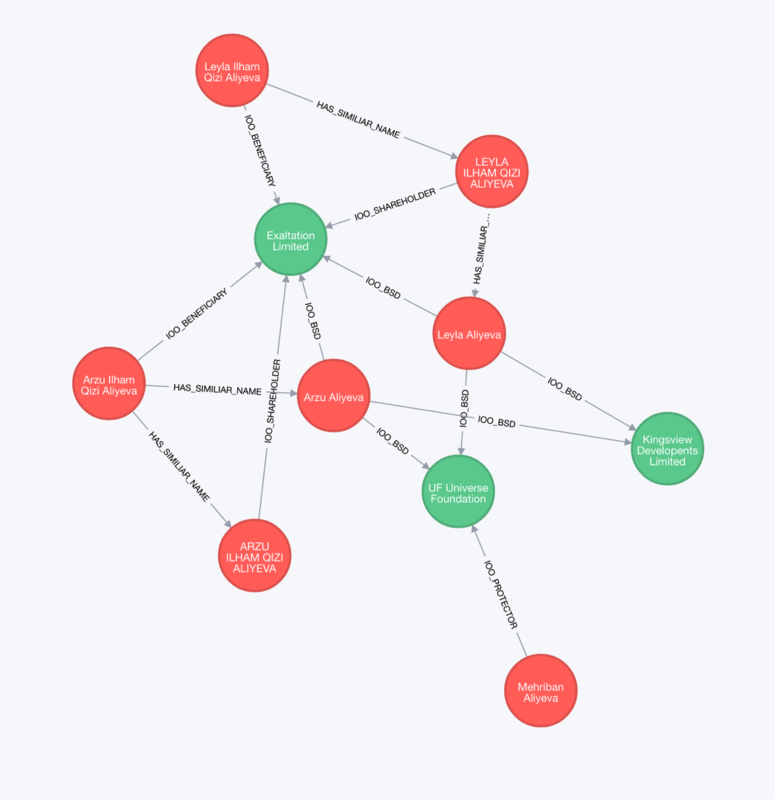 In this post, we look at the graph data model used by the ICIJ and show how to construct it using Cypher in Neo4j. 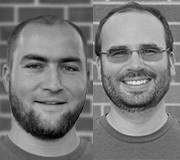 We dissect an example from the leaked data, recreating it using Cypher, and show how the model could be extended. Finding triads in the graph can show inferred connection. Here Bob has an inferred connection to CompanyB through CompanyA. All these entities have a lot of properties, like document numbers, share amounts, start- and end-dates of involvements, addresses, citizenship and much more. Two entities of the same name can have very different amounts of information attached to them, though this depends on the relevant information that was extracted from the sources, e.g., some officers have only a name, others have a full record with more than 15 attributes. Those have specific relationships like a person is the “officer of” a company. This is a basic domain that you can populate from documents about a tax haven shell company holding, a.k.a. the #PanamaPapers. Initially you classify the raw documents by types and subtypes (like contract or invitation). Then you attach as much direct and indirect metadata as you can, either directly from the document types (like the senders and receivers of an email or parties of a contract). Inferred metadata is gained from the content of the documents. There are techniques like natural language processing, named entity recognition or plain text search for well-known terms like distinctive names or roles. 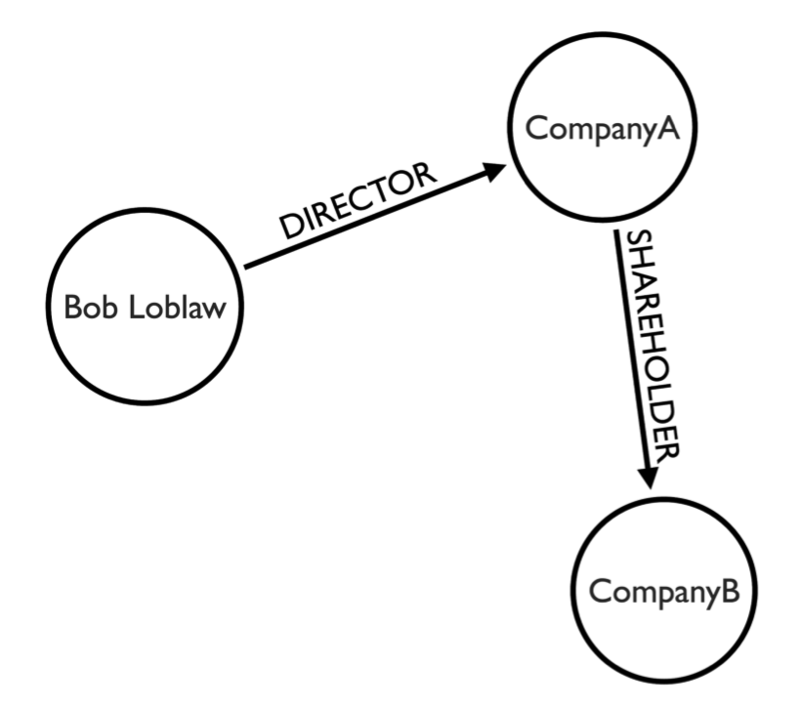 The first step to build your graph model is to extract those named entities from the documents and their metadata. This includes companies, persons and addresses. These entities become nodes in the graph. For example, from a company registration document, we can extract the company and officer entities. We can use similar logic to create relationships between entities that share the same address, have family ties or business relationships or that regularly communicate. There are some modeling and data quality issues with the ICIJ data model. The ICIJ data contains a lot of duplicates, but only a few of which are connected by a “has similar name or address” relationship, mostly those can be inferred by first and last part of a name together with addresses and family ties. It would also be beneficial for the data model to actually merge those duplicates, then certain duplicate relationships could also be merged. In the ICIJ data model, shareholder information like number of shares, issue dates, etc. is stored with the “Officer” where the officer can be shareholder in any number of Companies. It would be better to store that shareholder information on the “is officer of – Shareholder” relationship. Some of the Boolean properties could be represented as labels, eg. “citizenship=yes” could be a Person label. How Could You Extend the Basic Graph Model Used by the ICIJ? 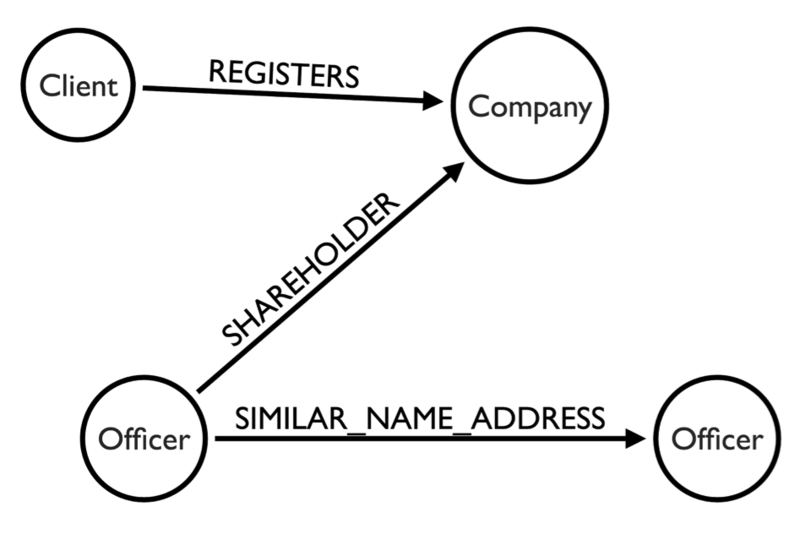 The domain model used by the ICIJ is really basic, just containing four types of entities (Officer, Client, Company, Address) and four relationships between them. It is more or less a static view on the organizational relationships but doesn’t include interactions or activities. Looking at the source documents and the other activities outlined in the report, there are many more things which can enrich this graph model to make it more expressive. We can model the original documents and their metadata and the relationships to people. Part of those relationships are also inferred relationships from being part of conversations or being mentioned or the subject of documents. Other interesting relationships are aliases and interpretations of entities that were used during the analysis, which allows other journalists to reproduce the original thought processes. Also, the sources for additional information like business registries, watch-lists, census records or other journalistic databases can be added. Human relationships like family or business ties can be created explicitly as well as implicit relationships that infer that the actors are part of the same fraudulent group or ring. Another aspect that is missing are the activities and the money flow. Examples of activities are opening/closing of accounts, creation or merger of companies, filing records for those companies or assigning responsibilities. For the money flow, we could track banks, accounts and intermediaries used with the monetary transactions mentioned, so you can get an overview of the amounts transferred and the patterns of transfers. Those patterns can then be applied to extract additional fraudulent money flows from other transaction systems. Graph data is very flexible and malleable, as soon as you have a single connection point, you can integrate new sources of data and start finding additional patterns and relationships that you couldn’t trace before. 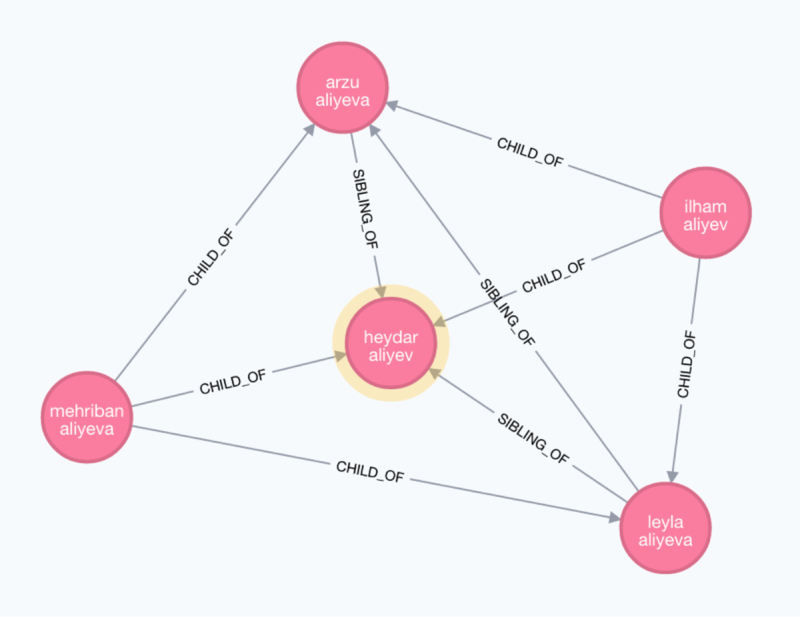 Let’s look at the family of the Azerbaijan’s President Ilham Aliyev who was already the topic of a GraphGist by Linkurious in the past. We see his wife, two daughters and son depicted in the graphic below. The family of Azerbaijan President Ilham Aliyev leads a charmed, glamorous life, thanks in part to financial interests in almost every sector of the economy. His wife, Mehriban, comes from the privileged and powerful Pashayev family that owns banks, insurance and construction companies, a television station and a line of cosmetics. She has led the Heydar Aliyev Foundation, Azerbaijan’s pre-eminent charity behind the construction of schools, hospitals and the country’s major sports complex. Their eldest daughter, Leyla, editor of Baku magazine, and her sister, Arzu, have financial stakes in a firm that won rights to mine for gold in the western village of Chovdar and Azerfon, the country’s largest mobile phone business. Arzu is also a significant shareholder in SW Holding, which controls nearly every operation related to Azerbaijan Airlines (“Azal”), from meals to airport taxis. Both sisters and brother Heydar own property in Dubai valued at roughly $75 million in 2010; Heydar is the legal owner of nine luxury mansions in Dubai purchased for some $44 million. We took the data from the ICIJ visualization and converted the 2d graph visualization into graph patterns in the Cypher query language. If you squint, you can still see the same structure as in the visualization. We only compressed the “is officer of – Beneficiary, Shareholder, Director” to IOO_BSD and prefixed the other “is officer of” relationships with IOO. We didn’t add shares, citizenship, reg-numbers or addresses that were properties of the entities or relationships. You can see them when clicking on the elements of the embedded original visualization. 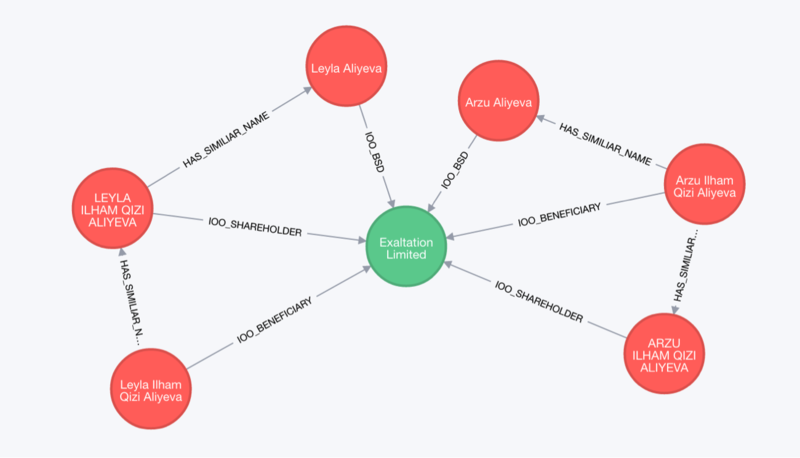 MATCH (o:Officer) WHERE toLower(o.name) CONTAINS "aliyev"
MATCH (c:Company)-[r]-(o:Officer) WHERE c.name = "Exaltation Limited"
Create a person node and connect all officers to that single person. Reuse our statement from the duplicate detection. 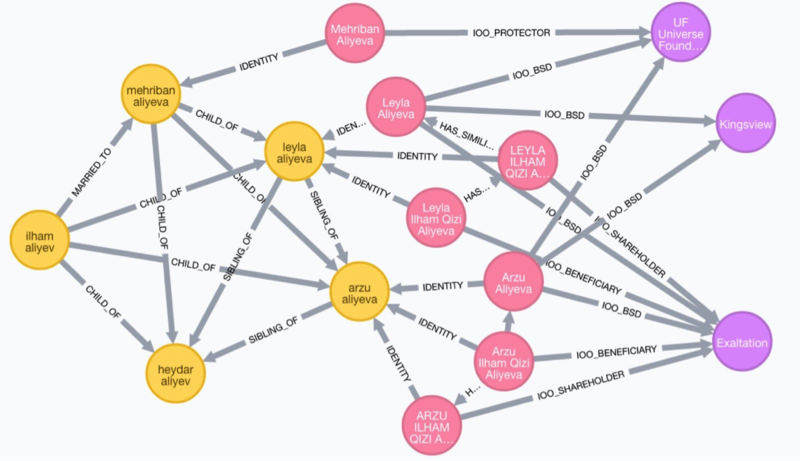 MATCH (p:Person) WHERE p.name CONTAINS "aliyev"
You can explore the example dataset yourself in this interactive graph model document (called a GraphGist). You can find many more for various use-cases and industries on our GraphGist portal. 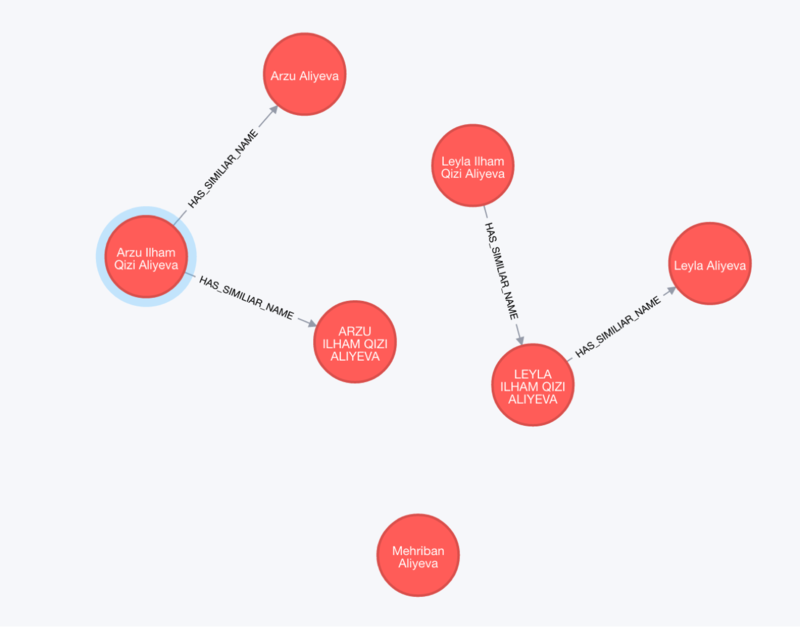 Want to start your own project like this using Neo4j? Click below to get your free copy of O’Reilly’s Graph Databases ebook and get started with graph databases today. Some of the best information I have seen so far related to this topic. Locking this information under the direct purview of ICIJ is a disgrace. Where is the money Lebowski? My money is on DOJ. It’s as close to a lock as possible; unquestionably a foregone conclusion. One question that may remain is how do the Journalists (and all other related parties) back down gracefully while still holding on to their self respectability. The answer to that question is: with proper perspective, it is an obvious decision. This will unquestionably be written in history as a watershed event. Though they don’t like to hear it, Journalists don’t control history. The DOJ controls history though. Look at their success rate. The dam will crack, slowly at first and then explosively. No amount of plugs will fix this structure of opacity. Whoever pulls their thumb out of the dam the last will lose. It is not an emergency if you are the first one away from the river banks. Pick the side that reflects reality. Information seeks freedom. Is there any illegal activity for tax dodging or otherwise in these links, involving Mr. Zaur Gahramanov of Socar Azerbaijan? This may be a copy cat of Mehriban or Arzu. Who knows. These shell companies and these connections appear to be closed since. They could be legal activity among some legal entities also. Please investigate.